Social Fund for Development (SFD) - Improving income through traditional cuisine "Pilot Project"
Home » Newsroom » Improving income through traditional cuisine "Pilot Project"
The project targets housewives and females of poor communities in Sana'a with a target of generating income via Yemeni traditional kitchen in a sustainable way to protect cultural heritage. Large number of women from different age groups attended to apply for the project, of whom only 60 women will be chosen based on specific criteria and conditions. The selected women will be trained by specialists in the following areas: traditional food preparation / hygiene & packing / project management/ loans mechanism / marketing skills. These women will be qualified to open or develop their own businesses or to be employed in such field. 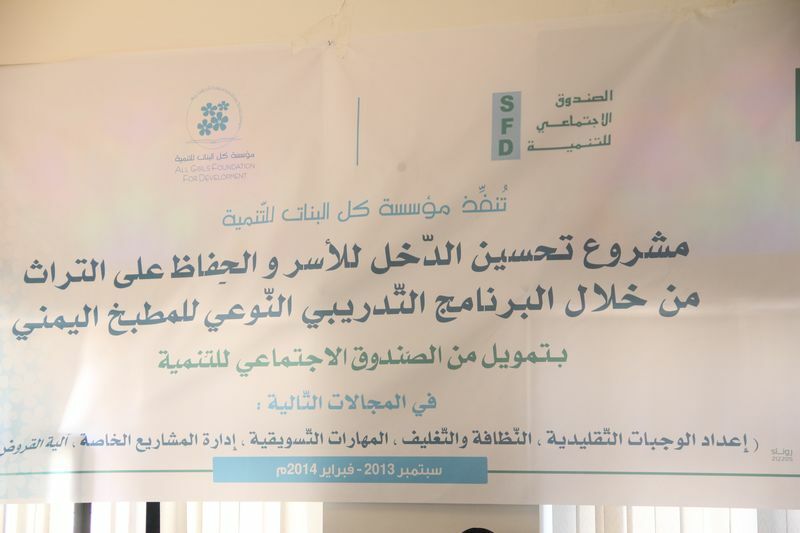 Part of SFD's vision is to finance and support important projects that preserve the cultural heritage; as such, SFD studied the proposal submitted by the All Girls Foundation and agreed to finance it. SFD considers traditional food as an important part of the cultural heritage that helps to generate income and improve the living conditions of poor households.